Use the forms and secure online applications below to apply for membership, loans, mortgages, and credit union accounts. Applying for a loan is quick, secure and easy. Apply for a loan any time of day or night. To open an account please give us a call or visit one of our branches. 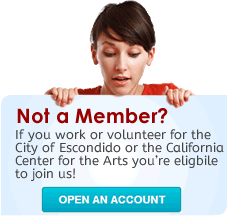 Your membership at Escondido Credit Union begins with your Share Savings account. Pay your $25 membership fee, and you're a member! Good service is the hallmark of a good credit union. At Escondido Federal Credit Union, you'll find excellent service as well as low fees. We are dedicated to serving our members through prompt and friendly service.